When it comes to statistics about African Americans and asthma, the numbers are enough to make you stop to catch your breath. 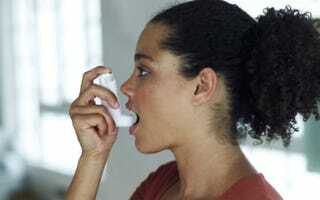 In 2008 African Americans had a 35 percent higher rate of asthma than whites. According to one study, a quarter of the black kids in New York City's Harlem neighborhood have asthma. African-American children have a 260 percent higher rate of emergency room visits, a 250 percent higher hospitalization rate and a 500 percent higher death rate from asthma as compared with white children. What's behind the disturbing stats? Time magazine reports that one reason could be that so many African Americans live near sources of environmental pollution. 68% of African-Americans (compared to 56% of whites) live within 30 miles of a coal-fired power plant — the distance within which the maximum ill effects of the emissions from smokestacks occur.